The Council of the General Secretariat of the Council of Ministers held its first session for the current year under the chairmanship of the Secretary General. Mahdi Al-Alaq and the advanced cadre. 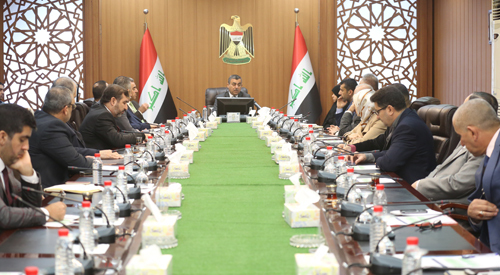 The Council reviewed a number of issues related to the development and increase the efficiency of the performance of the employees, in light of the investment of the results of the questionnaire carried out by the Follow-up, Coordination and Citizen Affairs Department to measure the job satisfaction of the employees of the General Secretariat of the Council of Ministers. He also directed the concerned departments to generalize the experience of the questionnaire to ministries and governorates, To improve institutional performance, particularly in institutions that directly affect citizens. The Secretary-General of the Council of Ministers during the session on the need to activate the questionnaires that reflect the levels of satisfaction to citizens to measure the level of services provided by state institutions. The Council stressed the importance of taking care of the safety of the Arabic language and the integrity of official communications between the Secretariat and foreign institutions, directed by the Division for the Safety of Arabic Language, has established workshops and training courses for employees concerned with the official language of communication and showing common mistakes and avoid using them to ensure the issuance of a scientific letter and careful.